The menu for today's Iranian lunch was decided upon based on what I had in the house. I knew I wanted to cook something vegetarian, so when I came across this recipe for Kookoo-e Gol-e Kalam (Vegetarian Cauliflower souffle), I was thrilled that the Pantry Goddess was so obliging. Quite similar to the Italian frittata, Kookoo-e Gol-e Kalam is an egg-based dish that can be cooked on the stove or baked in the oven. Vegetables, in this case cauliflower, are added to make a filling and easy vegetarian meal that could satisfy even the most rabid carnivore. 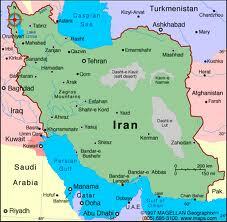 Known as Persia until 1935, Iran is located in Central Eurasia and Western Asia. One of the oldest continueous major civilizations that dates back to 2800 BC, Shia Islam is the country's official religion and Persian it's official language. Iran is bordered by Armenia, Azerbaijan, Turkmenistan, Afghanistan, Pakistan, Turkey and Iraq. Depending on the province and proximity to it's neighboring countries, food traditions and influences vary widely and include kababs, soups, stews, kookoo (vegetable souffles), rice, meats, plums, pomegranates, quince, prunes, apricots and raisins. Saffron, limes, cinnamon and parsley flavor the food, but are generally used in moderation. While the original recipe called for boiling the cauliflower, I am currently on a roasted cauliflower bender, and so decided to deviate from the recipe ever so slightly, which yielded very good results. Interestingly, this recipe also called for baking soda, which frankly, I would omit next time, since I think it lends a somewhat bitter taste to the dish, defeating the lovely flavor of saffron and the sweet taste of the cauliflower. Break cauliflower up into small pieces, drizzle with olive oil and season with sea salt. Roast for about 15 minutes until cauliflower is golden. When done, mash cauliflower slightly with a fork. Beat eggs. Di solve saffron in a bit of hot water and add to eggs. Heat oil in non-stick pan until hot. Pour in mixture, flatten surface with back of spoon and place lid on. Reduce heat and fry for about 10 minutes until Kookoo is cooked. Cut in 4 pieces (as you would a pie or pizza) and turn over to fry for another 10 minutes. Final Assessment: Pretty good, but I didn't like the addition of the baking soda at all, so I have omitted it from the recipe, which should improve it's standing to VERY good. baking soda ? How weird !! I've heard of a touch of vinegar, etc to make eggs fluffier, but never baking soda...good call to leave it out :) I need to check out the roasted cauliflower thing, too !! I don't have any saffron, so shall add some curry powder instead or maybe just tumeric. Love Persian cooking and this recipe with cauliflower came at just the right time. Got a beauty in my CSA box and I wanted just the right recipe to showcase it.